So HWbot recently launched this. I think the new division system is awesome and as someone planning to participate in division 5 I decided that I'll help everyone by compiling the available information on the NCP80122 controller found on the AMD reference design R9 285 and R9 260(X) cards. The red pin controls the Vcore you can solder a 10K ohm variable resistor(VR) to this and the ground to get control over the core voltage. The 2 green pins control the over current protection. By increasing the resistance between the 2 you will get a higher current limit. The only problem is that you have to find the resistor that these pins are attached to because I couldn't find a good enough photo and because R9 285 PCB designs differ quite a lot. If you want to completely disable over current protection just remove the resistor that these pins are attached to. 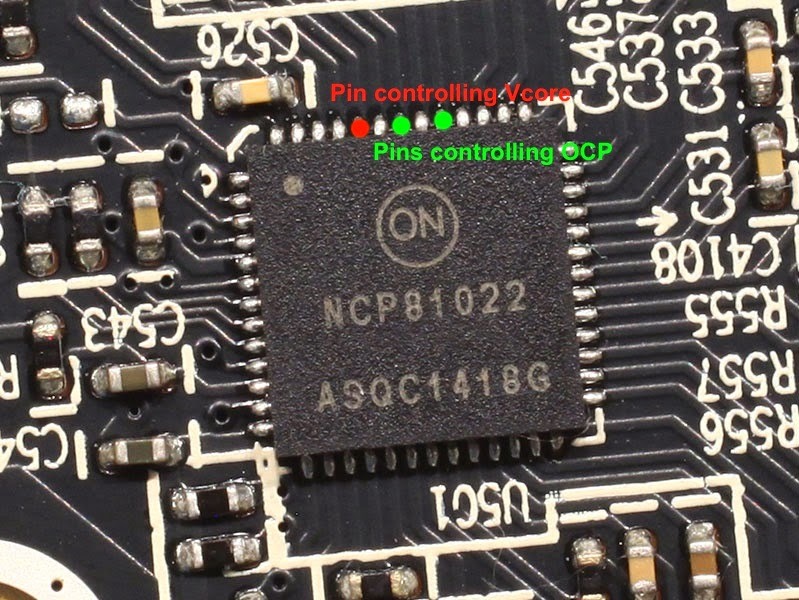 If soldering directly onto the IC's pins scares you(me too they are freaking tiny) then find the first resistor that the pin connects to and solder your VR onto the resistor. If you don't have a VR you can try using pencil. All these mods are universally applicable to GPU using the NCP80122 or PCP81022 voltage controller.